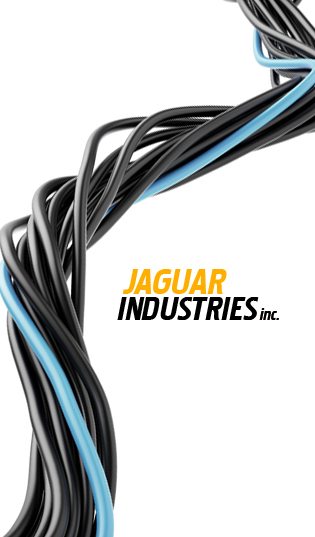 About Us | Learn More About Jaguar Industried Inc. About Us | Learn More About Jaguar Industried Inc.
Jaguar Industries has been a manufacturer and distributor of wires, cables, heat shrink tubing, as well as PTFE and PVC sleeving since 1979. Over this time we’ve made a name for ourselves in this industry for consistently providing personalized service, fast turnaround, low minimums, and a massive inventory. In addition to supplying OEM accounts, we also furnish smaller distributors with off-the-shelf delivery of standard and hard to find items from a 100,000 square foot warehousing facility. Jaguar Industries is big enough to stock thousands of wires, cables, and tubing items that include many unusual, hard to find “specials”, yet still small enough to offer personal service. We proudly lead the industry in wiring, cable and tubing solutions for industrial and military customers. We have a team of experts here at Jaguar that are committed to making sure you get exactly what you need and are completely satisfied when all is said and done. We are here to answer any questions or inquiries you may have about anything we carry. If you are looking for a specific size or specification please keep in mind that we can also accommodate custom wire and cable orders both large and small. Whether you need custom wire cables, coaxial cables or high temperature electrical wires and flexible wire we can provide them for you. Our massive inventory of electrical wires and cables serve commercial, industrial, and military clients. This includes a selection of high temperature wire for electrical use and coaxial cables for televisions and computers. Please call us for pricing and availability at 1.800.443.6528 or fill out the form below so we can send you a quote on what you’re looking for. In the meantime, take a look around here for a comprehensive selection of our product offerings including high temperature wire insulation, military spec wires, and heat shrink tubing. If we don’t have what you’re looking for, let us know and chances are we will be able to custom manufacture it for you. We are known for our custom wire and cable solutions. We look forward to serving you – thank you for choosing Jaguar Industries.